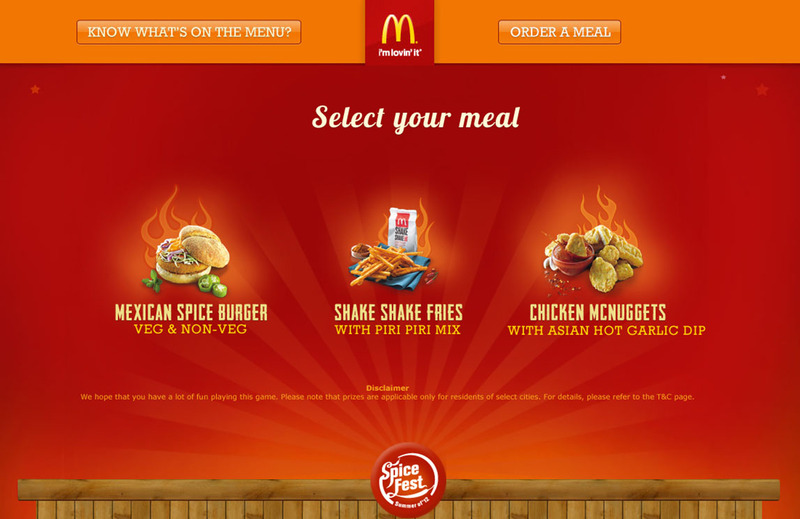 POWERING BRANDS: I'm Loving McDonald’s India's Spice Fest Brand Promo Site! I'm Loving McDonald’s India's Spice Fest Brand Promo Site! Indians like all things spicy and our fast food retailers know that. McDonald’s has introduced new Spicy Meals and is promoting it through a Spice Fest campaign and for the first time (for as long as I can remember) is using online extensively for its executions. The Spice Fest promotional rich media and microsite are engaging, original, well implemented and follow the theme and brand communication to a T. The core idea is a game where the top scorers every hour get to win a free Spicy Meal. The brand took over the home pages of Yahoo! and MSN today with an engaging game in banner where you could shake a pack of fries on the banner to make it spicier. The Spice Fest microsite has a fun webcam game where you need to select a meal and catch it with your mouth to get points! I flipped on the virtual falling fries though I haven’t tasted the real thing yet. Seems like a great diet idea! The site also lists the Spice Fest new menu items and you can also go ahead and order a meal. The creative execution is good across the board. Read more about the TV Commercial on Campaign India. Also check out the McDonald's Facebook Brand Page that profiles latest Spice Fest promotions. The microsite though doesn't have any links to the Facebook Brand Page. I loved this spice! What about you? I also liked the game!